August means summer is heading for a subtle change. Evenings begin to get cooler, skies are less hazy, most birds are getting a break from chasing fledglings all over creation, and the sounds of crickets and katydids during the night have replaced the trilling of the tree frogs. Bats are seen more frequently now as many moths and other late summer night- flying insects are abundant. Trees and shrubs have ripening fruit, deer are eating acorns already and, to top it all off, we just had a solar eclipse. Now is a great time to get outside and see what is happening in the garden and in the wild. 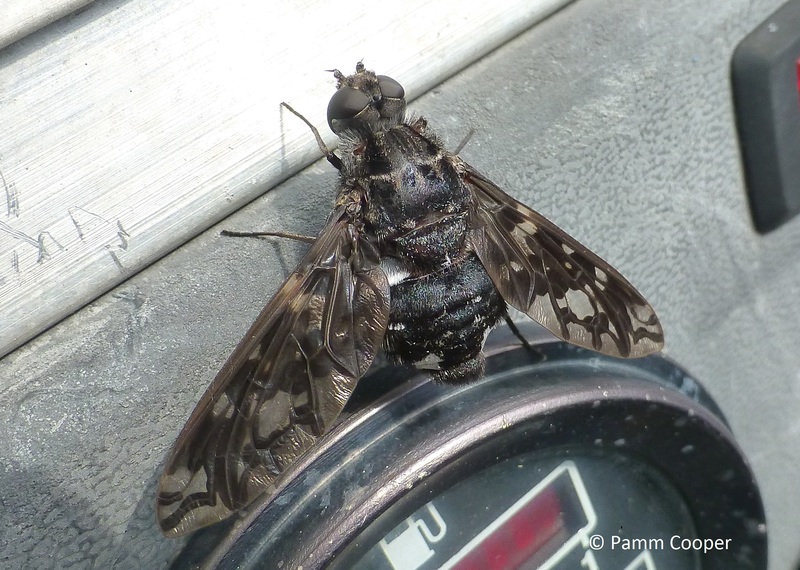 The tiger bee fly, Xenox tigrinis is a very large fly that can be seen flying about now. About the size of a quarter, this fly may fly low over lawns and can be mistaken for a wasp. It has large white markings at the end of its abdomen and they really stand out against the black color of the rest of the abdomen, resembling a bald faced hornet somewhat as it flies around, , apart from its size. Female tiger flies lay eggs near carpenter bee tunnels, and its larvae will eat the bee larvae that are developing within. 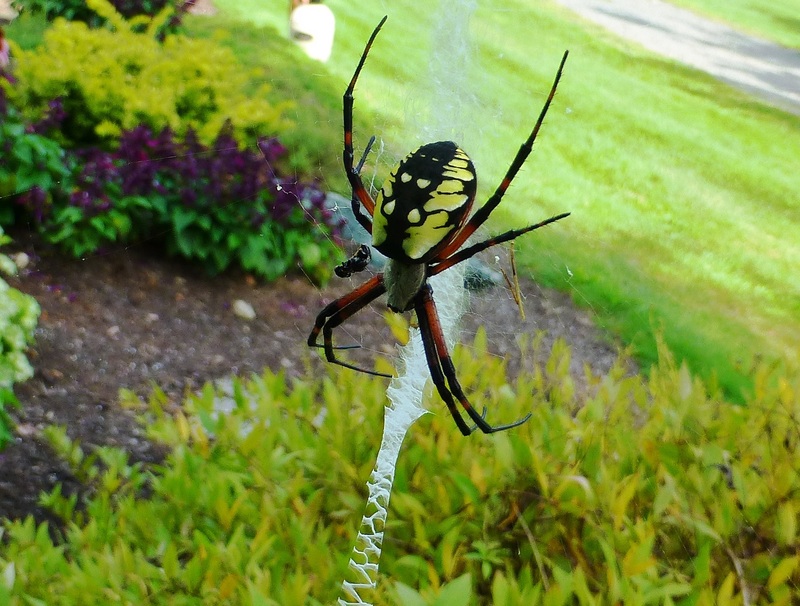 One of our larger spiders is the black and yellow orb weaver, Argiope aurantia. Commonly known as garden spiders, orb weavers are frequently found in gardens, meadows and fields. Their web has a zig-zag pattern at the end of a thickened strip of silk that and may signal birds so that they see it and avoid flying through the web, thus saving the spider from major repair work. Who knows? Other creatures seem to miss that cue and end up as little morsels in the food “web”. 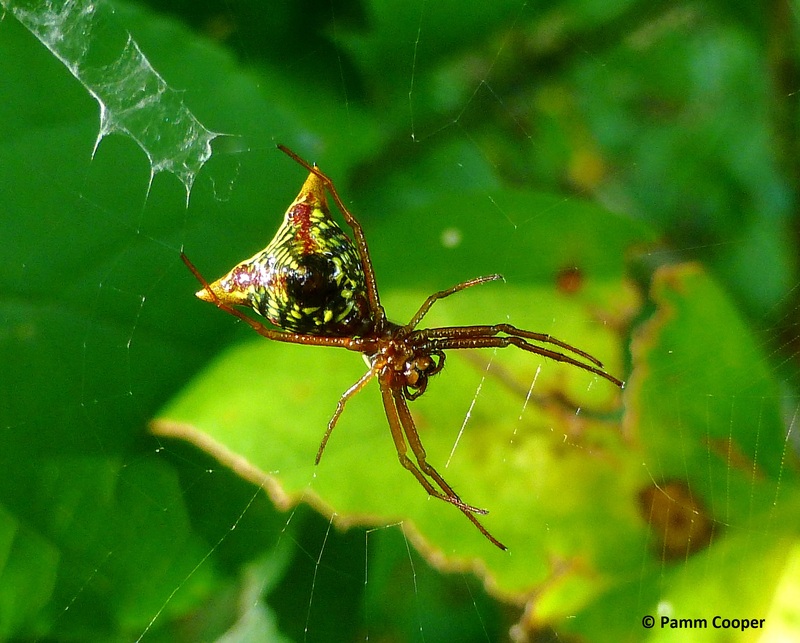 Another orb weaver, the arrow spider (Micrantha sagittata), is much smaller the black and yellow one, and is one of only three Micrantha species found in North America. It has an interesting web composed on a rather permanent frame structure and then the orb section is built inside the frame at dawn every day. In the evening, the spider will consume the orb part of its web and have to start anew the next morning. The whys and wherefores of this behavior is one to be marveled at, if not at all understood by mere mortals. Butterflies are having a banner year- even giant swallowtails are being seen in northern Connecticut as of late. 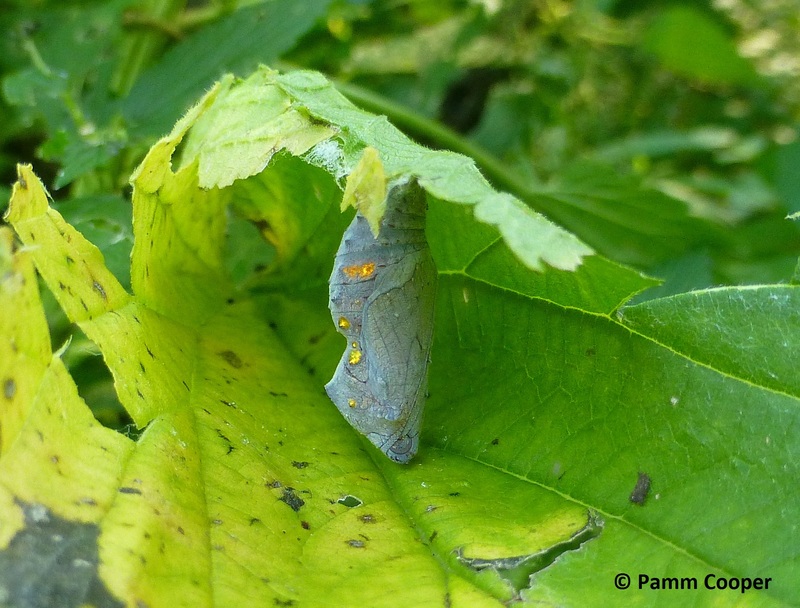 I just peeked inside the old stinging nettles leaf shelter of a red admiral butterfly caterpillar and found its chrysalis inside. One way to avoid predators is certainly to make oneself scarce. Monarchs, spicebush and tiger swallowtails and American ladies are abundant in numbers this year. Good plants for late season butterflies, especially migrators, are boneset, Joe-pyes, goldenrods, mountain mint, lantana, petunias, impatiens and bluebeard (Caryopteris). Mints and bluebeard are excellent for late summer pollinators as well. My gardens are humming with bee and butterfly activity right now as I have most of these plants in flower. Venturing out where forbs and small shrubs abound, you may run across the groundnut, Apios americana a native perennial vine that right now is in flower. The sweet- scented flowers are wisteria- like in form, appearing in small clusters along the vine. 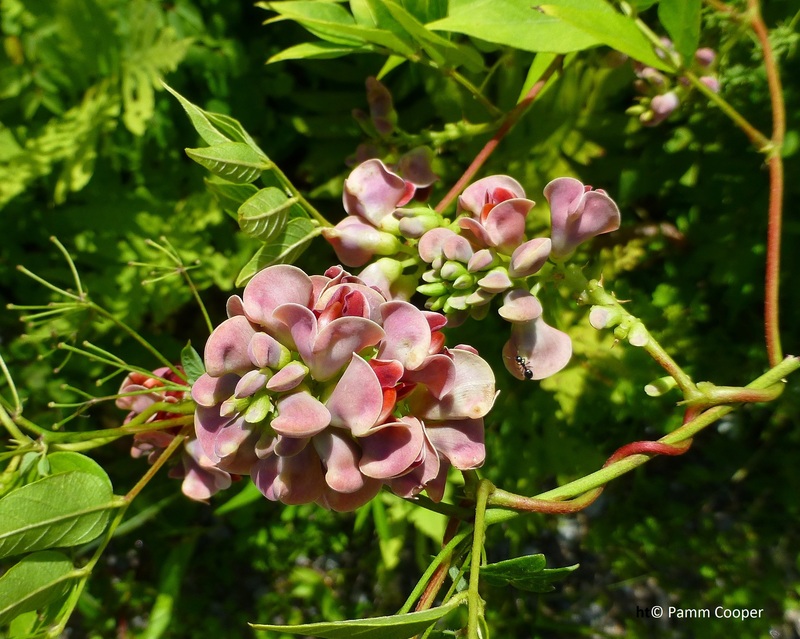 Found climbing among small shrubs and perennials like dogwoods, goldenrods and ferns, this plant is sometimes only noticed because its flowers are so striking in both color and clustered among a green background form the plant derives its name from the edible tubers that were consumed by native Americans and early settlers. 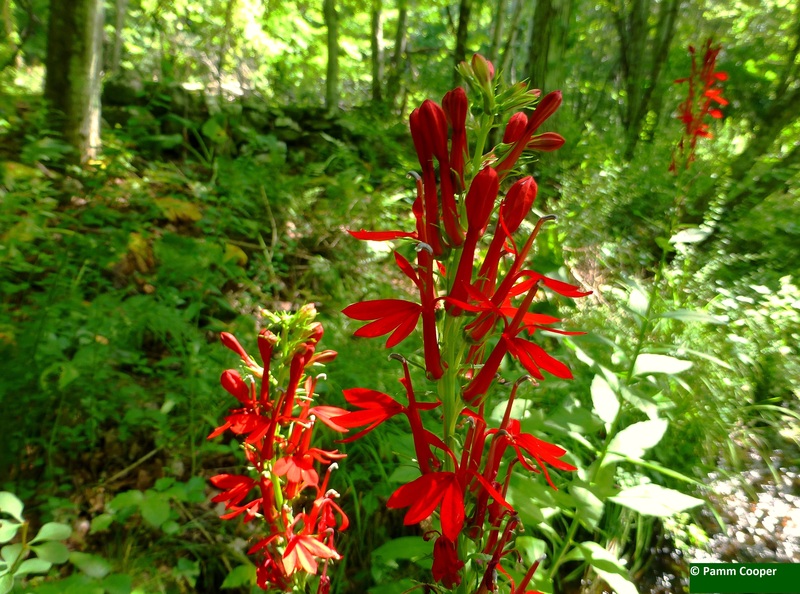 Cardinal flowers are also in bloom along watercourses now, and their brilliant dark red blooms and rich nectar attract hummingbirds. Along with jewelweed, cardinal flower is a great source of food for these energetic little birds. If you wait long enough when these plants are flowering, a hummingbird or two should make an appearance. Giant silkworm moths are putting in a second appearance this year, meaning a second or partial second generation of caterpillars will soon hatch. 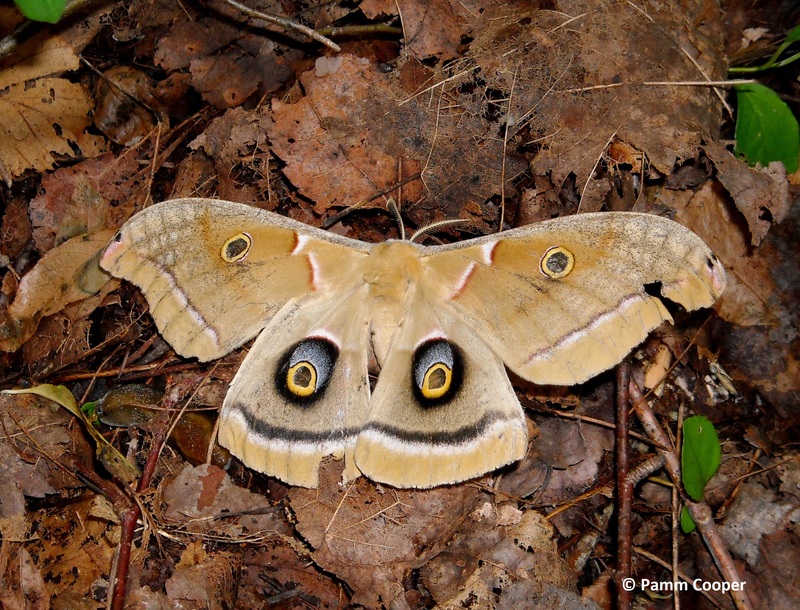 Over the last three weeks, Polyphemus and Luna moths have been seen, and there are fourth instar Promethea caterpillars out. Since the giant silkworm caterpillars take so long to reach the pupal stage, they may run out of foliage as many of the trees they feed on may shed their leaves before they can form cocoons. And be careful out there! This past weekend I found two saddleback slug moth caterpillars in two different areas of the state, both on foliage not far off the ground. 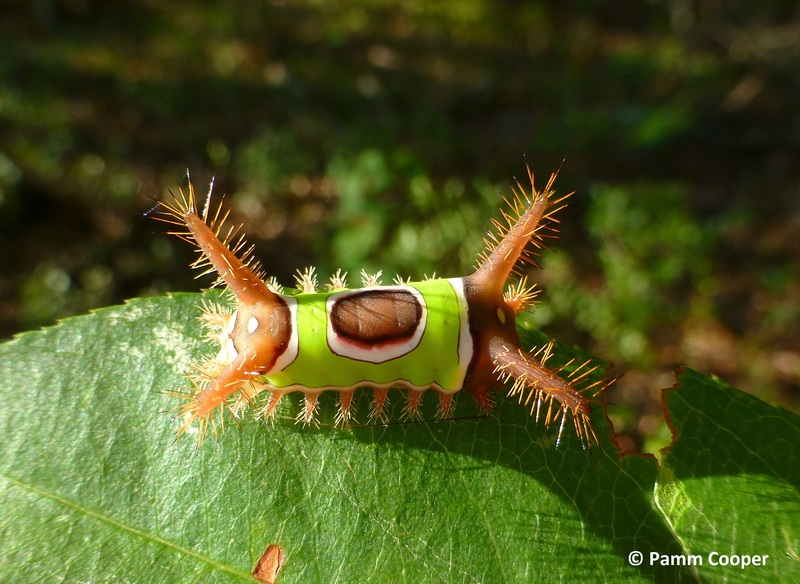 Though small, these caterpillars have many urticating spines that can cause a sensation like being stabbed with hundreds of tiny red-hot hypodermic needles. 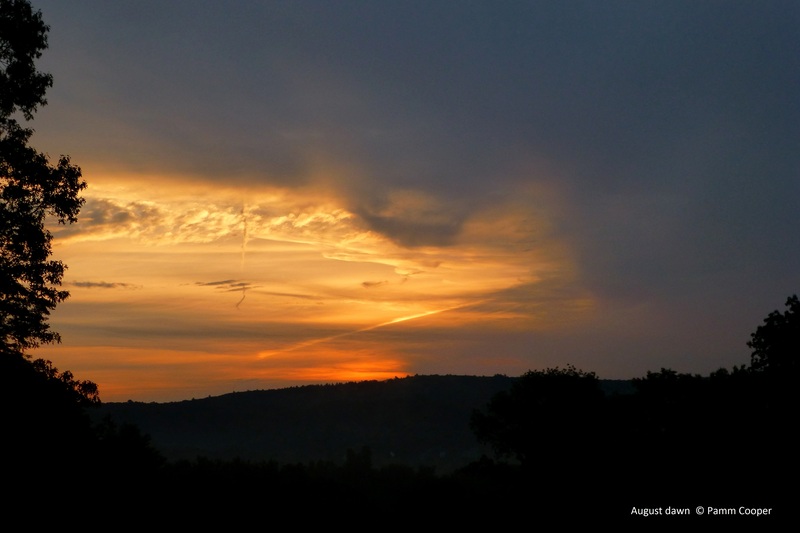 As we move into the end of summer, sunrises and sunsets should be more colorful as the skies get cooler and particles high in the atmosphere scatter the blue light to our west and east as the sun sets or rises. To the early bird, then, may you see a spectacular sunrise. 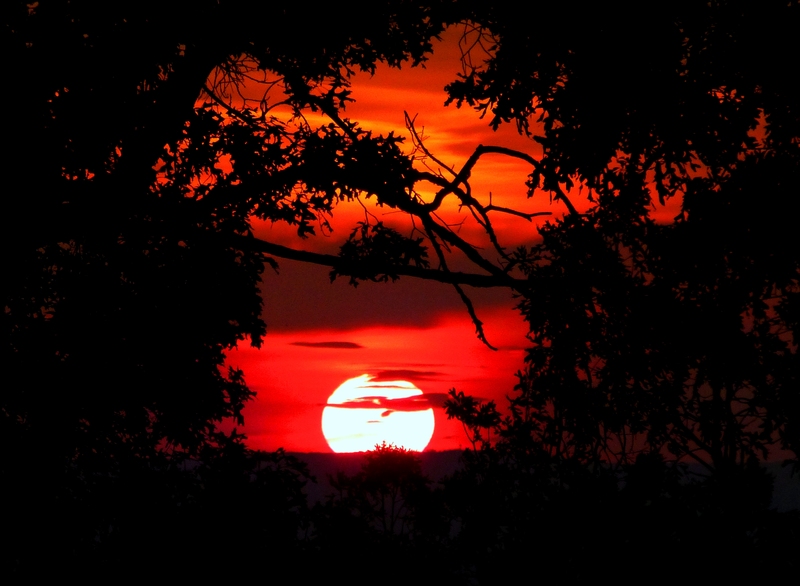 And to the observer at eventide, may you be rewarded with an equally breathtaking sunset. Reflected light, Iridescence, and refracted light ( interference ) are ways in which colors are made visible to the eye. Creatures only see light in the wavelengths visible to their unique eye structure. A rainbow represents the light spectrum which results from the sun striking raindrops ( or other prisms such as quartz ) and having its wavelengths bent, or refracted so that colors are made visible. These are the colors the human eye can see. There are more colors- such as ultraviolet or infrared which are only visible to creatures possessing eyes that are able to see these colors. Bees and some other insects see ultraviolet and are attracted to certain flowers by ultraviolet “ nectar guides” which lead the insect into the flowers far enough to ensure pollen pick- up or transference. Nature, of which we are a part, is full of the effects of sunlight striking objects and the colors that result are formed by what happens afterwards. Light travels in a straight line until it strikes something. When light hits an object it gets reflected, or bounced off, in different directions. Colors occur because light, composed of a broad spectrum of wavelengths will reflect and scatter differently after striking different objects. Some substances absorb certain wavelengths while the rest are then scattered. One of the effects of light scattering through the atmosphere has given rise to the saying “ red sky at night, sailor’s delight, red sky in morning, sailors take warning.” This is because weather systems generally move from west to east in the middle latitudes because the prevailing winds are westerlies. As rays of sunlight are pass through the atmosphere, they split into colors of the spectrum as they ricochet off water vapor and dust particles. The amounts of these particles determine what colors we see in the sky, and they can be useful indicators as to weather conditions. If we see a red sky at night, it implies the setting sun in the west is shining on clouds or particles of dust and water vapor to the east and atmospheric conditions to the west are clear ( or else you would not see the sun setting ). The sky appears redder if you can actually see the sun setting. As the sun still shines from the west, clouds that have broken up and moved east are still being shined upon by the setting sun, even after both the clouds and the sun may have disappeared from sight. Red light still breaks through the atmosphere while the shorter wavelengths will scatter and break up. Usually this indicates high pressure with its stable air is coming from the west and fair weather should follow. Red sky in the morning often indicates that a high pressure system has passed through and a low pressure system storm system may be moving in from the west. 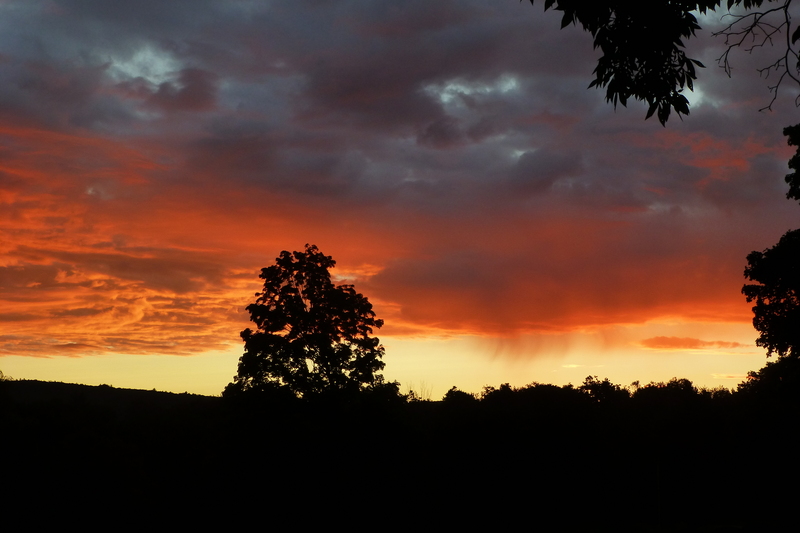 If the color of a morning sky is a deep, blazing red, it can indicate high water content exists in the atmosphere and rain may be on the way. Another way we see colors is through light reflected off pigments of objects. Grass appears green because chlorophyll in cells absorbs all colors except green, which is reflected as the sun’s rays hit the leaf surfaces. Amounts of chlorophyll in different species of plants are different and produce deeper, darker or lighter greens accordingly. Pigments are colors that last and are not affected by turning an object at different angles. Colors are produced by the selective absorption and reflection of specific light wavelengths. A green caterpillar looks green at all times if struck by light because certain wavelengths of light are absorbed, while green wavelengths are reflected and made visible to an observer. Usually only the outermost cells of an organism have pigments which produce the constant colors of species. In contrast to colors produced by pigments, structural colors are created by the physical interaction of light with the intrinsic characteristics of structures within an organism. 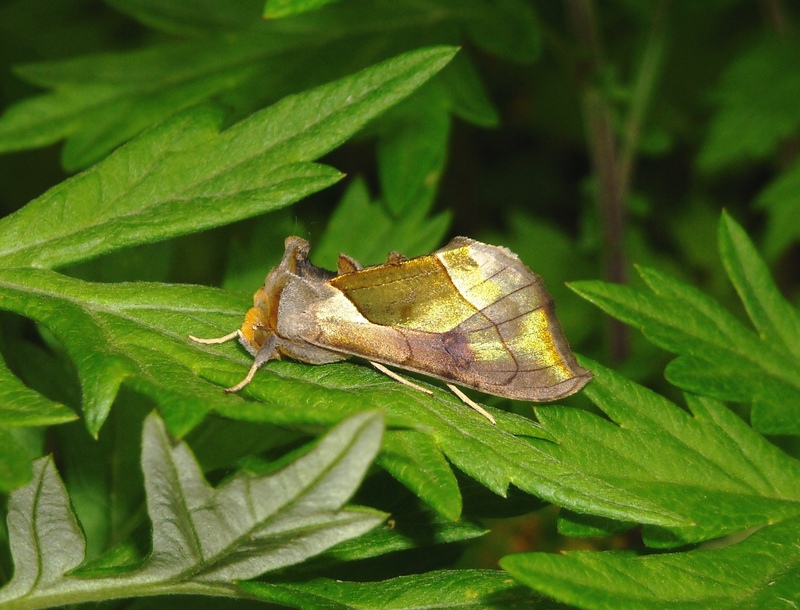 Iridescence is a type of structural color that is especially found in certain beetles and butterflies. Incoming light strikes many layers of plates or scales which results in multiple instances of constructive interference where light is reflected many times and produces vibrant and intense colors. Metallic colors in some beetles, such as Bupestrids and some Cicindela and others , plus the iridescence colors of many butterflies are the result of structural interference of incoming light. 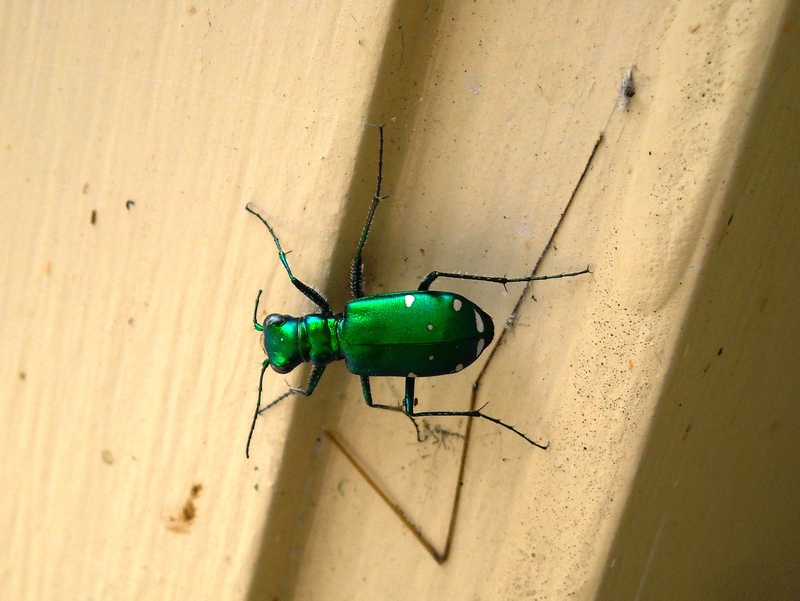 These insects also have pigments that produce constant colors. But light interference produces colors that can change as the viewpoint of the observer or the insect changes. 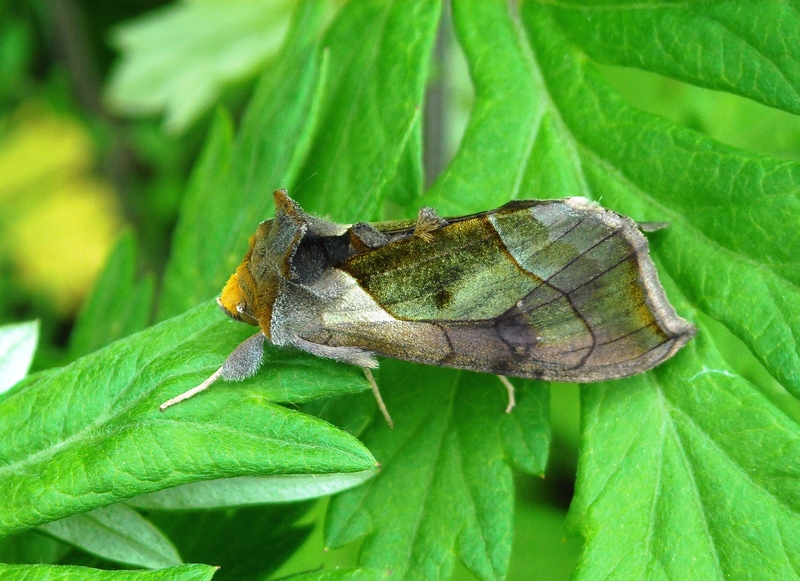 Or if the butterfly or beetle move into a shaded area, or it gets cloudy, iridescence is affected temporarily. This can make photographing insects exhibiting structural colors a vexing enterprise, frequently requiring patience and a lot of moving around as the insect moves to areas of different lighting. Full sun produces the most striking and clear colors and edges, so sunny days are optimal for seeing the best iridescent colors. Some plants have brilliant, shiny fruits that have an inner geometry of films and pockets that make for an aesthetically pleasing color that can last sometimes for many months, Winterberry maintains its bright red coloration throughout the winter, making it a vibrant contrast to white snow that may stick to its branches. It is highly visible to any wildlife that may need its fruits for survival. 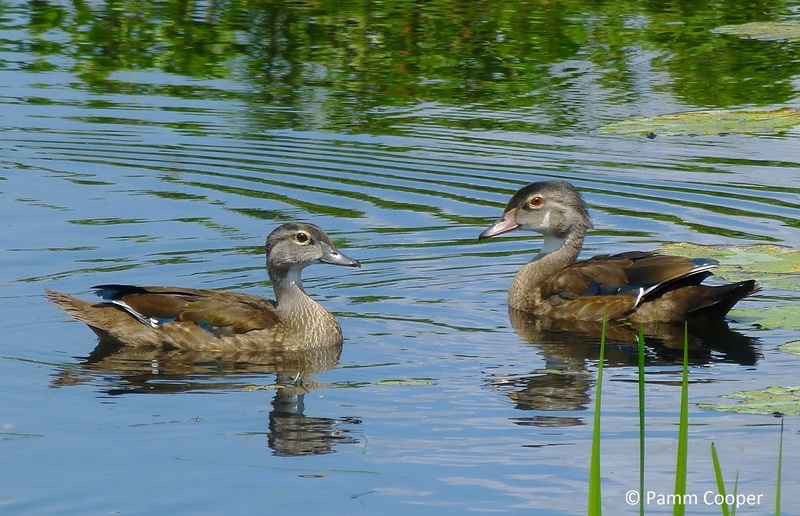 Birds have feathers than produce colors both by pigments or by light refraction caused by the structure of the feathers. Feather color may be the result of either or both. The throat of the male Ruby- throated hummingbird refracts light like a prism which results from the structure of the feathers splitting light into the rich ruby color. Depending on the angle of the viewer, the throat can appear black or an iridescent ruby red. Sometimes tiny air pockets in the barbs of feathers will scatter incoming light that produces a blue color, like that of a blue jay or indigo bunting. Backlight the same feathers, and they look brown because of melanin in the feathers. This is just the tip of the iceberg, a mere reflection and consideration of how color is produced in nature. We can all be backyard scientists if we slow down and observe our natural surroundings, of which color just one primary part of the composition. Even in the winter gloom, there are vibrant sunsets and other splashes of heartening colors in the landscape that can cheer us up, if just for a moment.